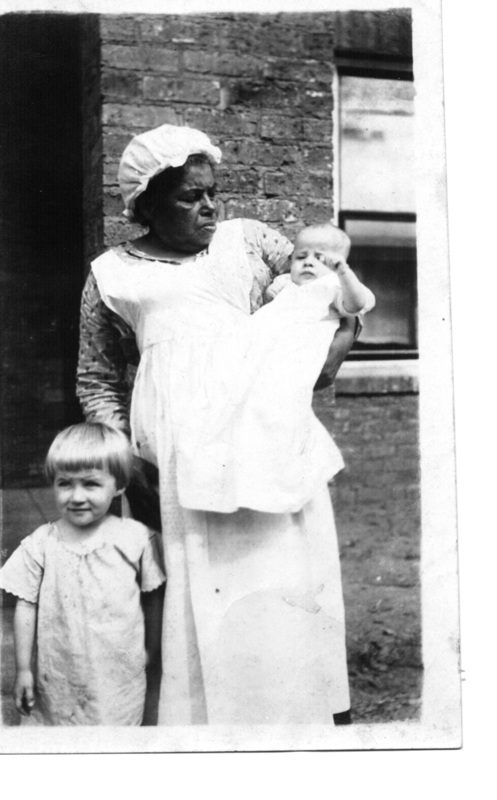 From a friend: “Your story (about Luvenia Duckett) reminded me so much of my grandmother’s maid. Her birth name was Lena Barton but she changed it to Nadema Nathara when she converted to Islam. She never attended services as far as I know but she did avoid pork. She lived with my grandparents starting when she was 13 or so. 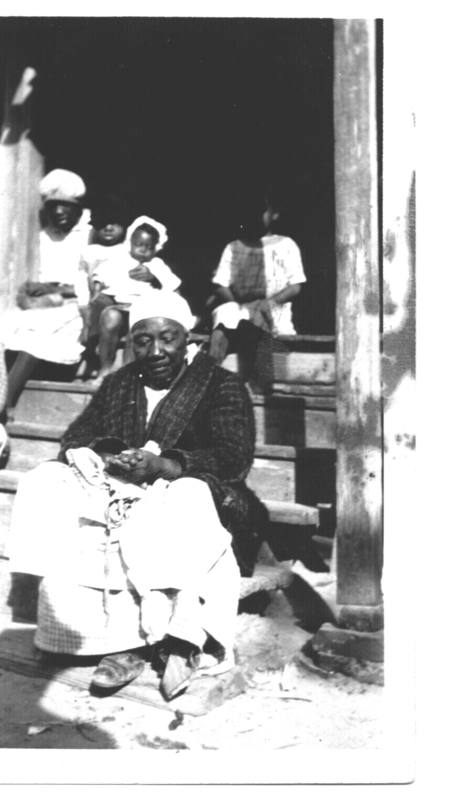 Her mother and her brother moved from the south with her in the first decade of the 20th century. She could read and write but very little. When she did write more than a sentence, it was always in Iambic pentameter. This fascinated my mother. She was an excellent cook and house keeper. She would come up to the summer cottage with the family. They had a separate house for her that had electricity but no plumbing. When they travelled, my grandfather would only stop at restaurants that would serve her as well. “I grew up in the South—a child of good and decent parents. 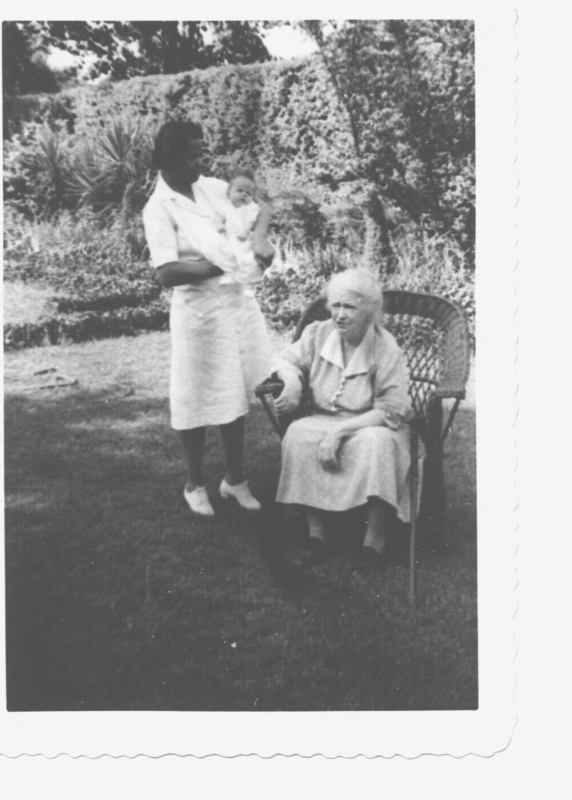 We had women who worked in our household, sometimes as surrogate mothers. They were invisible women to me. I can’t believe I couldn’t see them. I don’t know where my head or heart was. I don’t know where my parents’ head and heart were, or my teachers’. 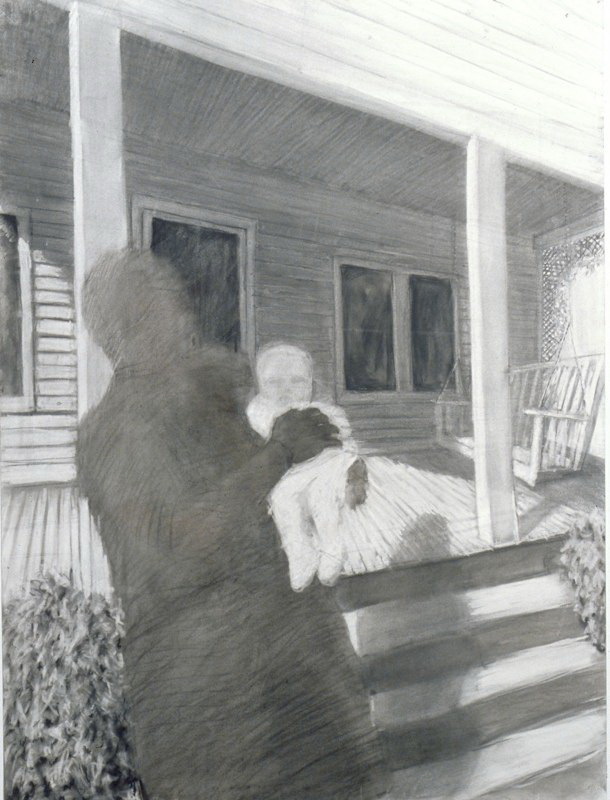 We were blind to the reality of racism and afraid, I guess, of change.” The reference to “invisible women” reminds me of the compelling work of artist Rodney Grainger (mentioned in previous posts–see photographs) who creates images of domestic workers fading away or faceless behind their white charges. Born in Birmingham, Alabama in 1948 and raised by an African American nanny in racially segregated Birmingham of the 1950’s and 60’s, my wonder for the great paradoxes of that relationship has never ceased. 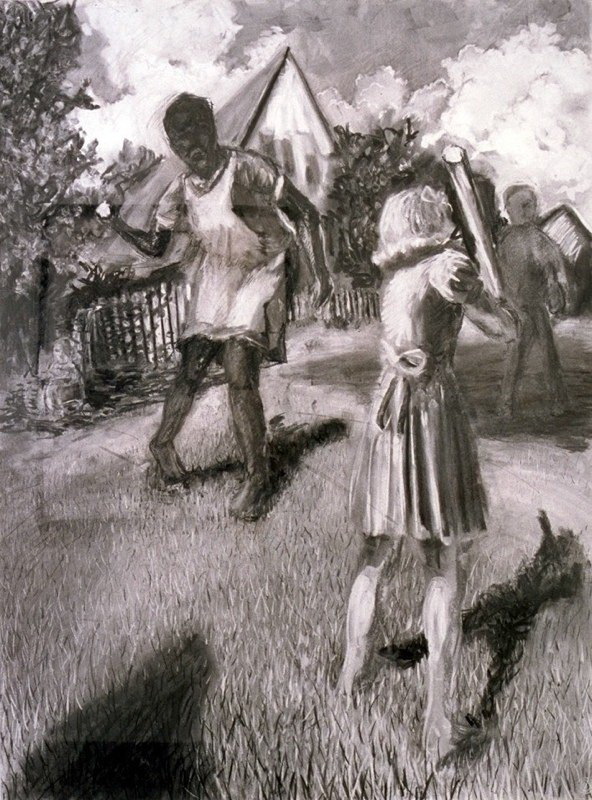 Ultimately visual images from this experience would ignite an artistic attempt to understand deeper human connections lying below those divisions within race, class and gender. 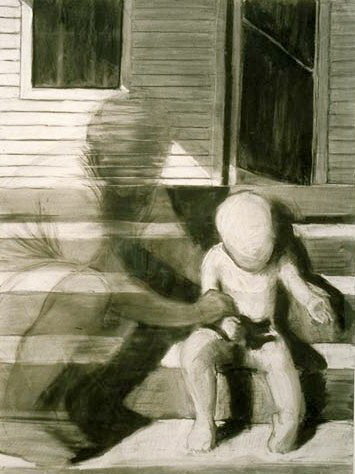 For this narrative series Black in White, I have chosen to draw in charcoal rather than painting with color because drawing is so closely aligned to writing. Black and white imagery also serves as a primary language of dreams and the unconscious and I believe is best suited for a graphic awakening the imagination. 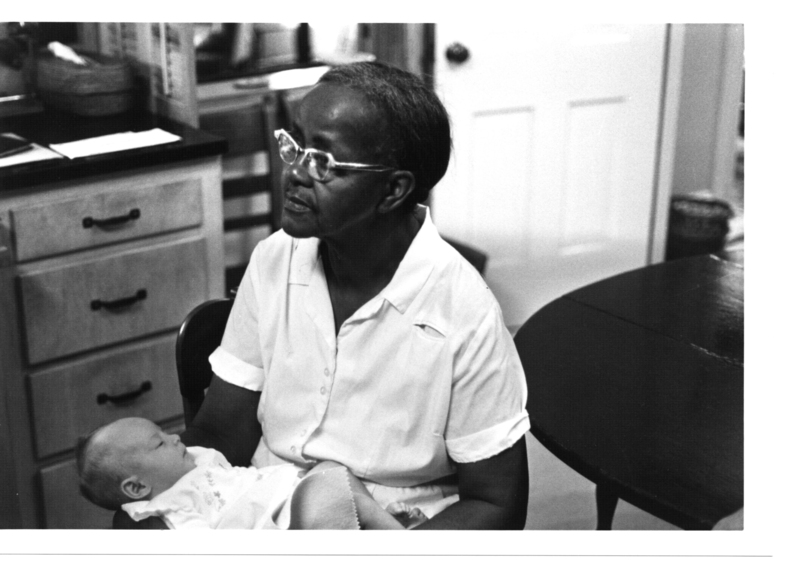 Grainger’s images are haunting and remind me that these early connections to a caretaker are mostly unresolved for many white people raised by African American women. 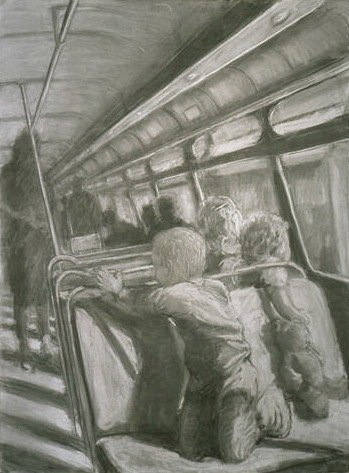 It must have been deeply troubling as a child to hear of the race riots in Birmingham during the 1960s. Did he understand what was happening at the time? Visit http://www.beaconhillartiststudios.com/BeaconHill/Works_on_Paper/Pages/Black_in_White.html#grid for more images of his work. Welcome to the Just Like Family bog. Please open the INTRODUCTION post [June, 2011] first for more detailed information about the blog. Thank you. You are currently viewing the archives for August, 2011 at JUST LIKE FAMILY.